Hunters’ dogs and other pets can be carried safely in the automobile trunk if a ventilator is provided. A vent which resembles the cap of the gasoline tank can be installed at the side of the trunk, well above the exhaust fumes. 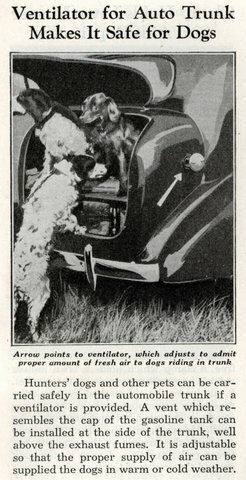 It is adjustable so that the proper supply of air can be supplied the dogs in warm or cold weather.